^ Gilmore Girls' Alexis Bledel, Boyfriend Split - Breakups, Alexis Bledel, Milo Ventimiglia : People.com Archived 2008年3月13日, at the Wayback Machine. 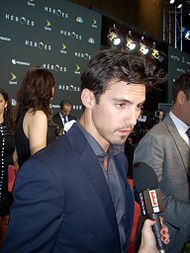 ^ Albert Kim,"Milo Ventimiglia," Men's Fitness accessed April 12, 2012. ^ Wendy Koch, "Sexiest Vegetarian? PETA's Contest Goes Beefcake," USAToday March 3, 2010.